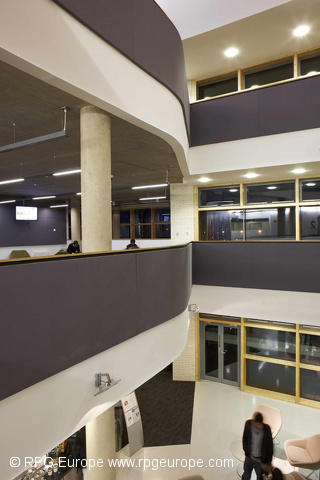 Completed late 2010, RPG Europe were proud to be principle suppliers of the Acoustic Treatment Package for Phase 1b, University of Bedfordshire. Designed by RHJM Architects, this project featured several custom elements including High Impact RPG Absorbors, Slotted Acoustic Oak Planking, Stretch Fabric Walls and Custom Acoustic Parts procured from Sweden. RPG Europe worked with Kier Marriot to fit to their schedule, all RPG parts where made to order with several areas being fabricated on site, and this was all done within the time scale and in budget. Our fitting team ensured that all products were installed correctly, modifying parts to allow mounting of switches, sensors and bells where necessary.